Since Establishing in 2004, StartingAClothingLine.com has empowered countless beginners, professional fashion designers, companies and schools from around the world with our unique and proven blend of fashion products. We offer one of a kind resources that work in harmony with the goal to help you start your clothing line from A to Z, design it, get it made + effective wholesale strategies to get your line sold in stores! We are the exclusive home of Our Powerful Fashion Design Software Suite – Digital Fashion Pro – which is used worldwide by Clothing Lines, Professional Fashion Designers, Aspiring Fashion Designers to design their lines with. See Our Fashion Mogul Clothing Line Start-Up Kit 2019 Edition for step by step help on how to start your own clothing line, getting clothing manufacturers to make it, software to design it and more. It is our Total Solution For Helping You Launch Your Line. 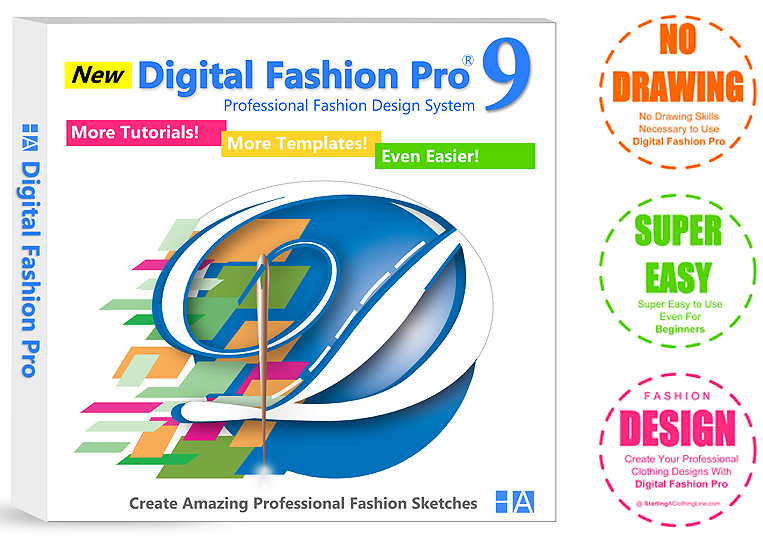 The Ultimate Fashion Design Software Digital Fashion Pro – Start Designing Your Own Clothing Line With It Today! Design all types of clothing and fashion styles with Digital Fashion Pro fashion design software. Design your own shirts, jeans, pants, dresses, sweatshirts, shoes, costumes, handbags, swimwear, T-shirts, coats, jackets, skirts, leggings, lingerie, vest, hoodies, eyewear, socks and more. Even if you are a true beginner, you will learn how to design clothing like a pro with Digital Fashion Pro. Digital Fashion Pro is a complete clothing design software system featuring hundreds of clothing templates, digital fabrics, models and training wrapped in one. Plus it’s super easy to learn and use. You will be creating your own professional fashion sketches in minutes! Start designing your own apparel line with it today. Our software is great for beginners, professional fashion designers, clothing lines and academic fashion design classes and programs on the college and high school level. Learn More About Digital Fashion Pro Fashion Design Software Here! Don’t let your label fall victim to lack of real fashion industry knowledge – Get the #1 book on starting a fashion label – The Official Step by Step Guide to Starting a Clothing Line Course Now! It covers how to create a clothing line business plan, how to start your clothing line and trademark it. It also covers how to get your line made, how to work with apparel manufacturers, how to sell and market your apparel line to clothing retailers and more. This powerful fashion business book is a must for anyone starting an apparel brand. Combine it with some of our other products like the Fashion Business Center for your spec and line sheet templates. Our products work in harmony to help your clothing line excel! These products will also help you estimate how much money it will cost you to start your a clothing line + create your business plan. Learn how to start your own clothing line from scratch here. Finding a talented clothing manufacturer to make your line can be a challenge. The reason being is the manufacturer(s) that you decide to go forward with making your clothing must meet certain standards. You want to work with a manufacturer that can deliver your samples and production orders in a timely manner. You want an apparel manufacturer that will deliver quality products to you. You also want a garment factory that can make your clothing at a great price that still allows you to be competitive for your market. Many go with overseas factories while others look for manufacturers based in their home state or country. Once you find a great clothing manufacturer you will want to make sure you are also living up to your end of the bargain. You want to make sure you are paying them on time. You want to make sure you do not have excessive changes and tweaks to your style. You will want to provide them with professional digital sketches of your clothing. You want to provide measurements and detailed direction on how you want your clothing made. You can use our Fashion Mogul Kit to help you work with clothing manufacturer and get the best from your potential relationship. The Mogul Kit comes with our list of our 500 clothing manufacturers and fashion suppliers that can help you get your clothing line made.